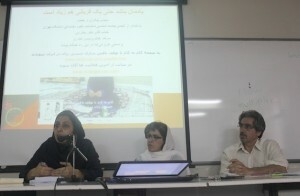 Under the title “Razor and Tradition” the Sociology Faculty of Social Sciences at Tehran University organized a conference about Female Genital Mutilation (FGM) in Iran on 11th of July 2015. This conference shed lights on all aspects of FGM in Iran. It was the first time that an official body connected to the government broke the silence about this issue in Iran and most of the official and important newspapers published speakers’ speeches in full details. The psychoanalyst Dr Nazi Akbary, sociologist Dr Ahmad Bokharayee and Rayehe Mozafarian, writer of the book “Razor and Tradition” and campaigner of Stop FGM Iran, spoke at the conference. He mentioned 10 differences between ethical (moral) and morality (ethics) in his presentation. Therefore, in the society, the morale moved to the ethics with changing a wide range of interests. The starting point for the formation of moral principle was the common response to the basic needs of human beings. But the beginning of the formation of ethics was the variation of human demands that has become more prominent after the formation of communities. Dr Bokharayee concluded that the patriarchal culture of the community and a set of social and cultural factors were involved in the spread of the tradition of female genital mutilation in Iran. Rayehe Mozafarian started her presentation with counting 11 seconds and drew the audience’s attention to the fact that every 11 seconds a girl is circumcised in the world. For the operation which damages women’s sexual organ there are three different terms: Female Genital Mutilation, Female Genital Cutting and Female Circumcision. All three terms are valid for extracting the meaning of laws. She continued her presentation with a reference to Islam and Female Circumcision: “Islam does not recommend circumcision of girls. To extract a ruling in Islam referring to 4 sources is necessary: Quran, Sunnah (Prophet Muhammad`s life), Ijmah (means the viewpoints of religious leaders) and analogy (in this case compare male and female circumcision). There is no evidence in all these sources that Islam recommends FGM. In another part of her speech she asked the government to give all data and information and all statistical studies to UNICEF. There are 29 countries in the list of UNICEF but more than 10 countries do not add in this list yet and most of them are Middle Eastern countries where FGM is happening but because the respective governments do not accept to introduce themselves to UNICEF addition to this list is postponed and on the other hand more girls are more at risk. Iran’s government should accept this problem as common in Iran. 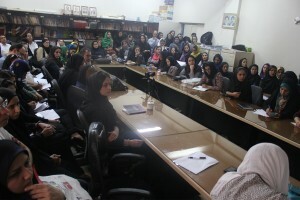 Mozafarian concluded her speech by inviting the audiences to join to “Stop FGM Iran” reminding of the slogan of this campaign: “even one victim is too many”. By hannahcaroline36 in News, Project Updates on 2015/08/03 .